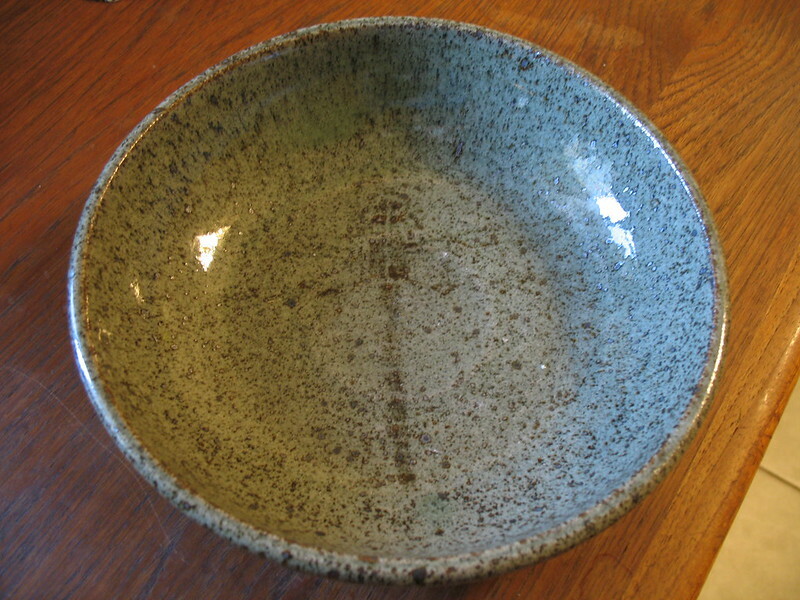 Four of my pieces were glaze-fired and ready to be picked up this past Thursday. The outcome was decidedly mixed. So, you know, just a slight loss of detail [sarcasm]. I used iron oxide to paint on the dragonfly, and now am wondering whether I should switch over to using a black stain instead. And if so, which one. The underlying problem is that with the firing schedule here, I don't have time for any test firing. Frustrating. Beautiful, but fatally cracked. I feel like I've been struggling with this porcelain clay a lot, in ways I hadn't anticipated. For a couple of previous pieces, I had problems with glazes running and sticking to the kiln shelf, and observed similar kinds of stress cracks on those pieces as well. 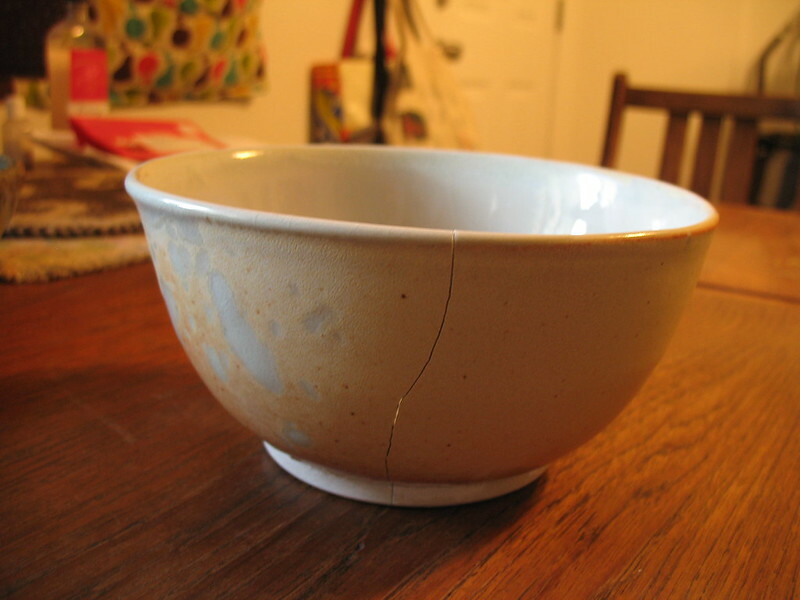 Our ceramics instructor says the cracks look to her like the sort of cracks that form during cooling and removal from the kiln shelf. There's no way to fix something like this so as to make it food safe, so this bowl is probably going to wind up in the pile of dilemmas. 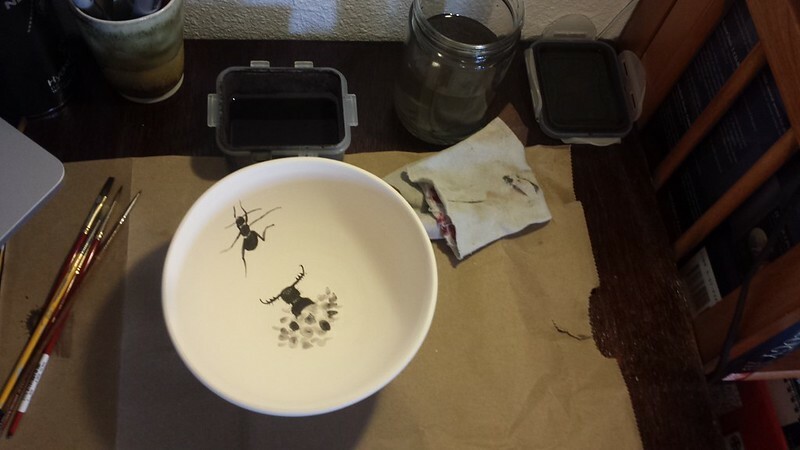 (other dilemmas: what to do with old chipped mugs). The only strange part is what wound up happening with the handle. 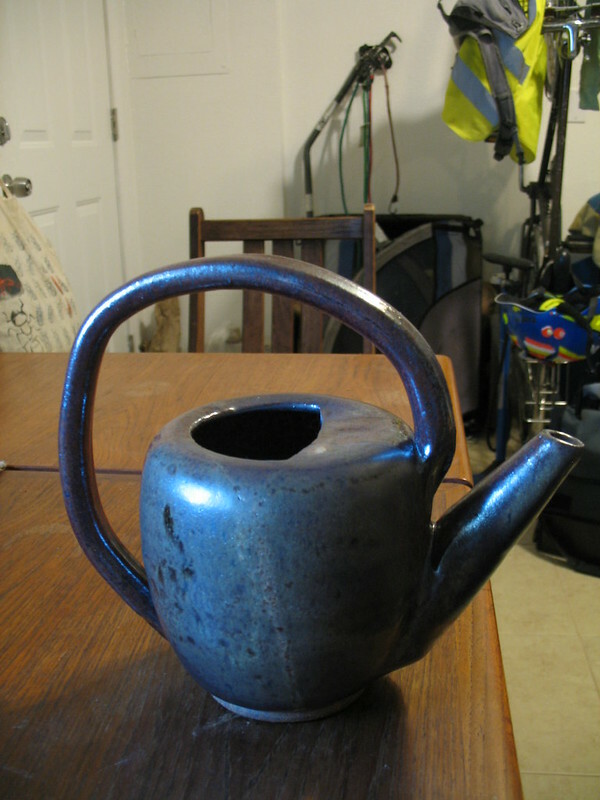 Somehow it seems to me like the clay for the handle shrank in diameter, so the handle's narrower, but the overall shape of the handle relative to the body of the watering can remained the same size. I.e. the clay shrank more in one direction than in the other. So the handle is a little too awkwardly large for the piece. Still, not too bad. Just, slightly strange. Totally adorable. I drank my morning latte out of it today. Not that I need any more mugs. So maybe it's time to clear out the mug collection and get rid of the more chipped/awkward ones. 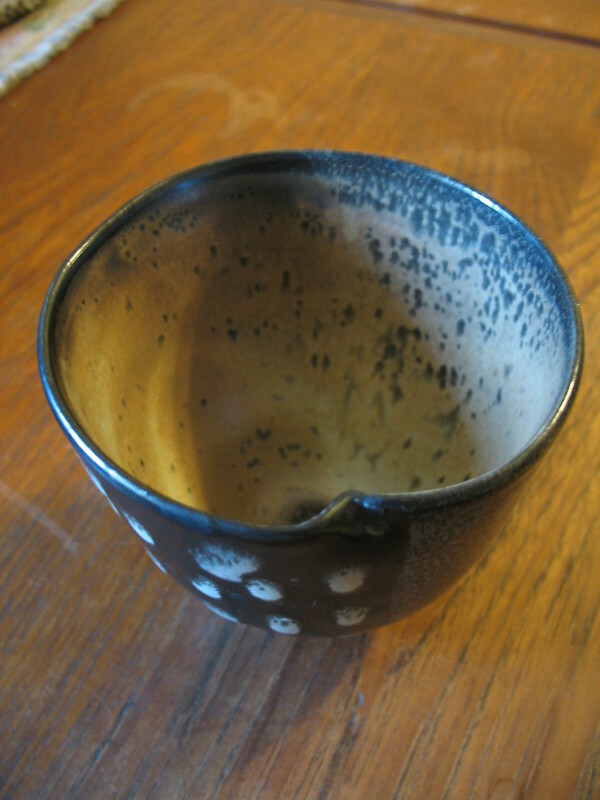 If any of you have good ideas for what to do with old, broken ceramics, I'm all ears. 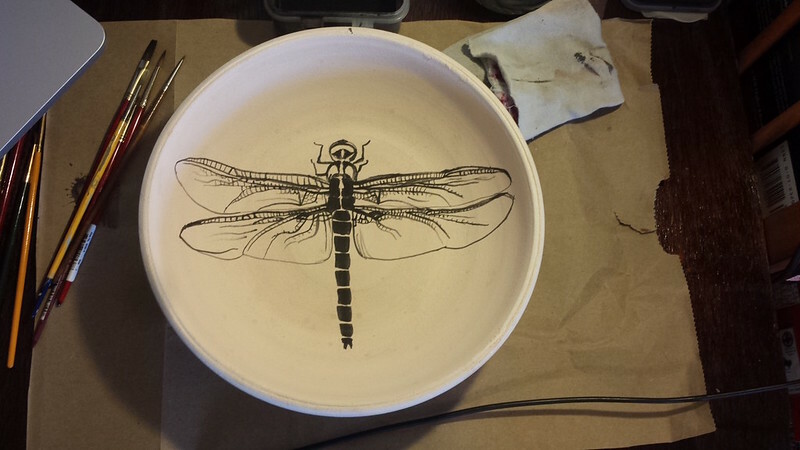 Your dragonfly bowl is beautiful, but I would have also been annoyed at losing that level of detail. I love the watering can! How beautiful! 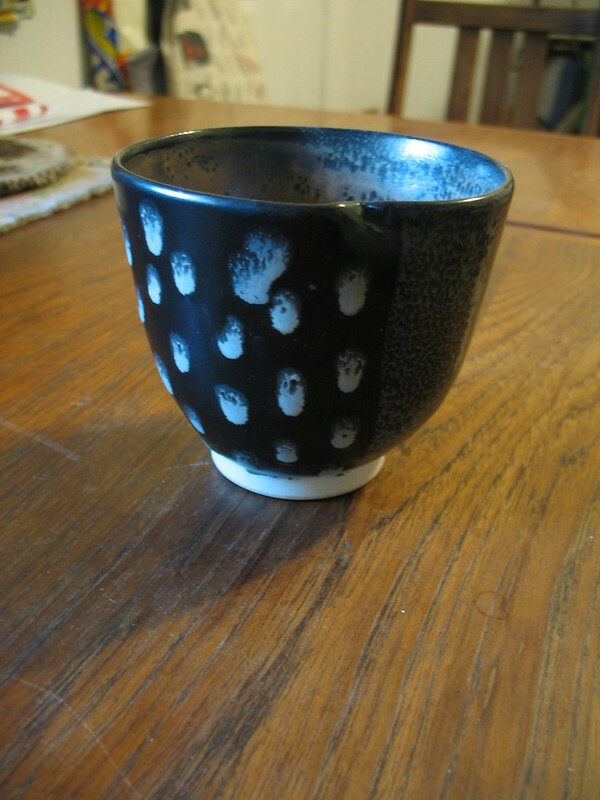 The spots on your accidental dent mug are good too. 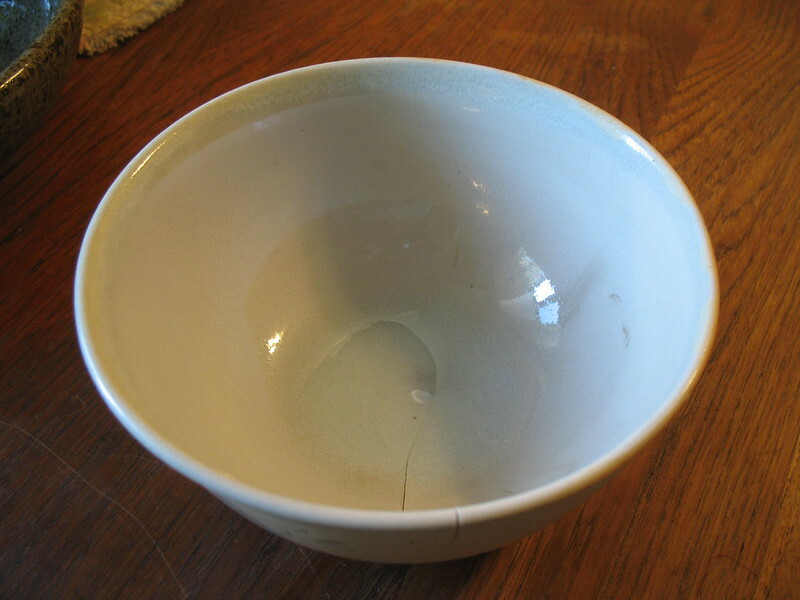 Re: old broken pottery, if you do container gardening, you can smash it to smallish pieces and use the pieces to line the bottoms of your containers, leaving a more aerated layer to aid in soil drainage. If you have a foundry and need to cast a new refractory lining for your melting oven, grog, aka smashed-up pieces of bricks/ceramics/other old ovens, is the recommended filler for the refractory you're pouring. You mix the grog in about half and half with the fireclay/sand mixture. I think every one of those is pretty amazing-looking. Check and see if someone in the arts community in your area does mosaic work, they are often looking for interestingly colored crockery and ceramics.